When you cross the Daintree River by ferry, you’ll quickly feel like you’re driving millions of years into the past. A narrow road meanders through dense jungle, with ancient ferns, cycads and trees creating magnificent tree tunnels. 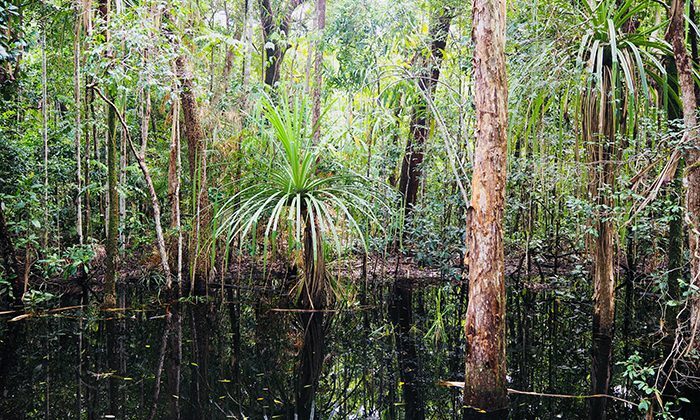 Welcome to the world’s oldest forest. 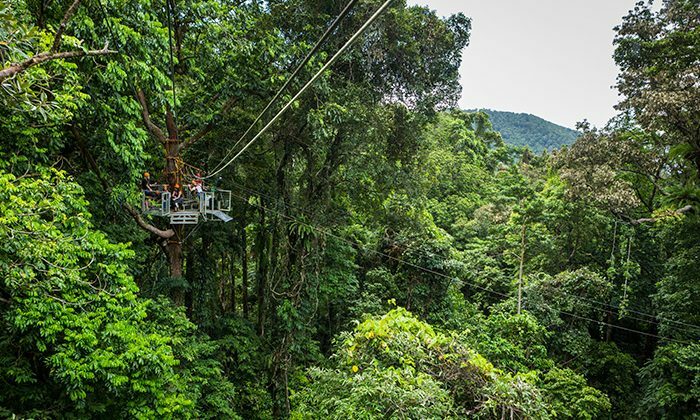 Head towards Cape Tribulation, where Jungle Surfing Canopy Tours will take you high into the trees for seven thrilling ziplines through the Jurassic-like foliage. The human hamster wheel that raises you to the first platform is definitely something to experience. 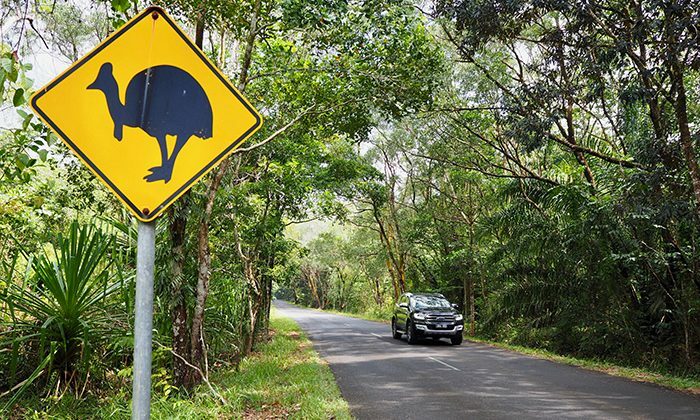 The road to Cape Trib makes for a great day trip, just watch out for the cassowaries! Length of Trip : From Cairns or Port Douglas, make it a full day trip. If you're staying in Cape Trib, budget a half day. Click here for the latest Jungle Surfing prices. Best time to go : Open year round, late August to early November is a pleasant time to visit. Family friendly : Ages 3 to 103! There's a few places to eat opposite the Jungle Surfing check-in office, like the Turtle Rock Cafe and the Whet Cafe. On your drive up or down, pop into quirky Mason's Cafe to sample some of the interesting bush meat (emu, roo, camel, croc) and brave the roadkill burger. Private swimming pool access and large BBQ areas make for a perfect family vacation destination at the Oaks Lagoons in Port Douglas. Jungle Surfing and Jungle Adventures Night Walks is located on a private reserve in Cape Tribulation, approximately 3 hours drive north of Cairns and 2 hours north of Port Douglas. The ferry across the Daintree River operates from 6am to midnight daily and costs $26 return per vehicle (EFTPOS available 9am – 5pm, otherwise CASH ONLY). When you drive off the ferry, follow the main Cape Tribulation Road north for approximately 45 minutes, until you enter Cape Tribulation. 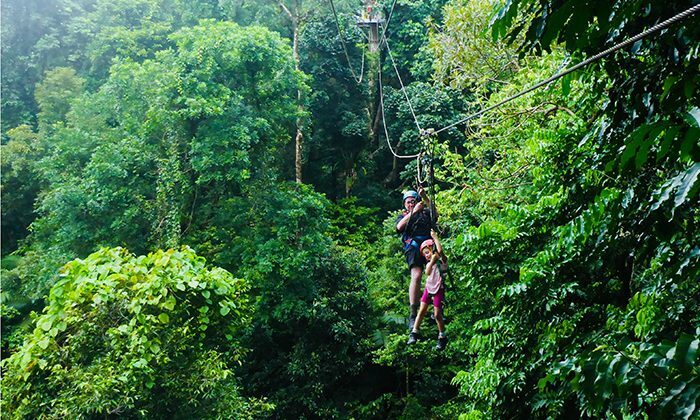 Operating out of Cape Trib, Jungle Surfing offers six tree platforms and seven ziplines in the heart of the Daintree. Tours continue heavy rain or shine, for this is, after all, a rainforest. 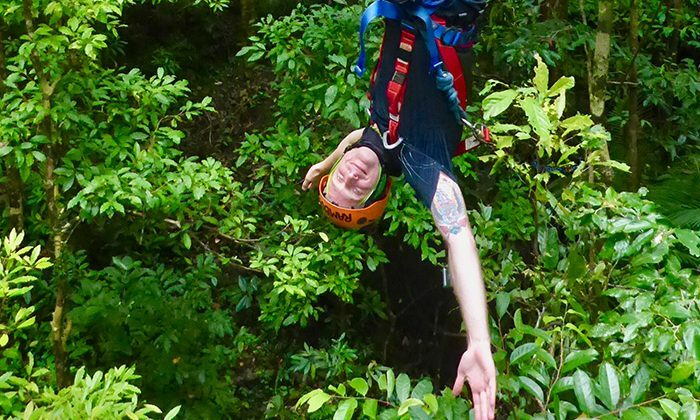 If you’ve ziplined before, you’ll appreciate the sheer diversity of the eco-system, the opportunity to be immersed in an environment unlike any other on the planet. If this is your first time, you’ll quickly understand why ziplining is so popular, safe and ideal for bucket listers of all ages. 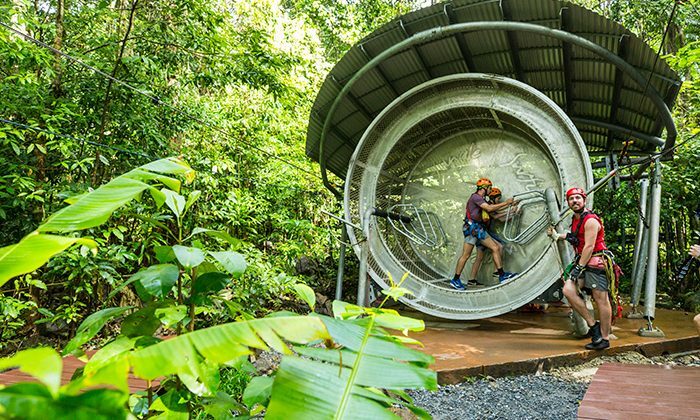 Does Jungle Surfing in the Daintree belong on The Great Australian Bucket List?